Garnet promotes self-confidence and encourages balance, including a balanced approach to sexuality (as it eliminates unnecessary inhibitions). It promotes and strengthens the body’s ability to regenerate and fight infection, especially in the case of fevers and upper respiratory problems, and can be helpful in the treatment of heart conditions. Garnet engenders a feeling of community in periods of difficulty, and gives support in times that could be described as the Long Dark Night of the Soul. 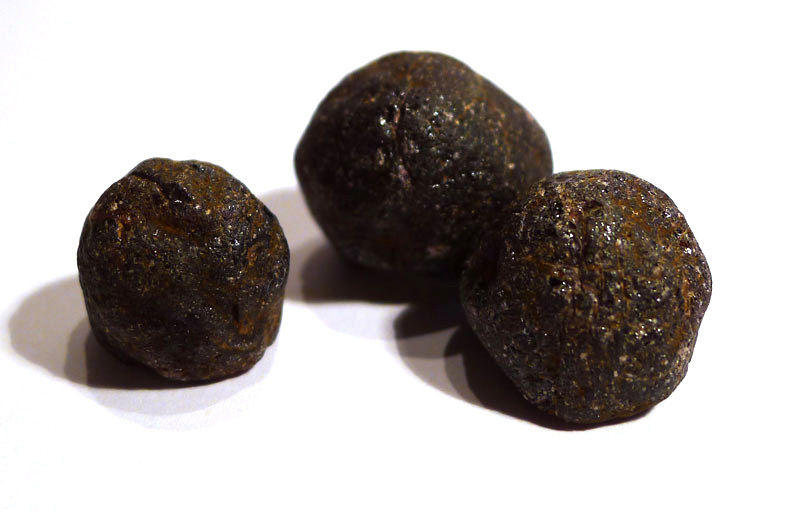 Almandine garnet in particular is considered to confer grounding and protection, and is highly recommended in moments of crisis. Garnet is the name of a group of related silicate minerals with the same structure. Recently, it became known to mineralogists as the Garnet Group, and even more recently has become the Garnet Structural Group, which includes minerals that are similar in structure but are not silicates. For ease of understanding, I am sticking with the older version – Garnet Group – which only includes silicates. 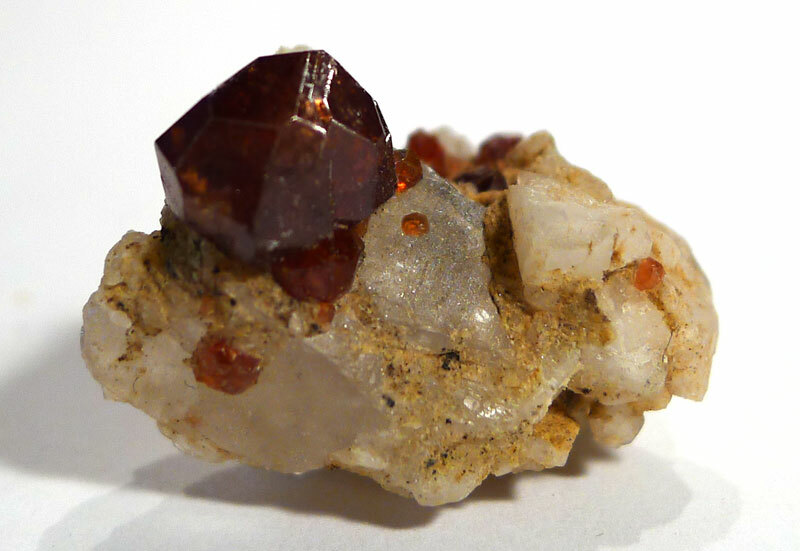 Garnets form primarily in metamorphic rocks, but are also found in igneous rocks. 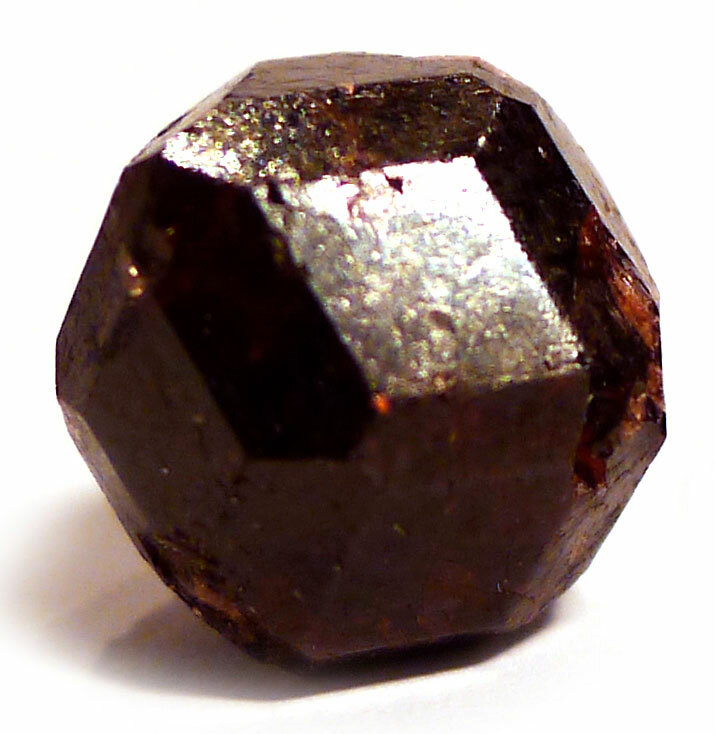 In fact, almandine garnet has been found as an inclusion in diamond. There are fifteen different garnet species with differing chemical formulae The crystal system is cubic, and garnets usually form as rhombic dodecahedrons or icositetrahedrons. 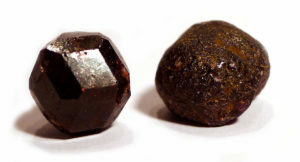 This makes them relatively easy to identify by shape (note the distinctive diamond pattern of some of the faces), although garnet cubes do occur, and garnets are commonly found in secondary alluvial deposits (when they are eroded from the primary deposit and washed down river), which smooths the faces. Garnets are very popular in jewellery making, and are often faceted. Because of its brittleness, garnet jewellery often chips at the edges. Garnets are not just red – in fact, the colour range is enormous. Garnet is the classical name for a group of silicate minerals with the same structure, now referred to as the Garnet Group. Garnet was named ΑνθραϪέ (no direct translation) by Theophrastus, possibly about 325-300 BC, but seemingly this was also a name used for ruby, spinel, and red-pink sapphires. 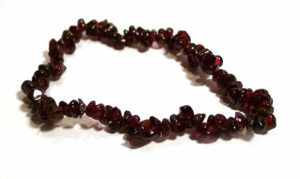 The word garnet comes from the 14th‑century Middle English word gernet, meaning “dark red”, and is also derived from the Latin granatus, from granum, meaning “grain” or “seed”. This could be linked to pomum granatum, or pomegranate, in reference to garnet’s resemblance to the deep red colour and shape of the seeds of this fruit. 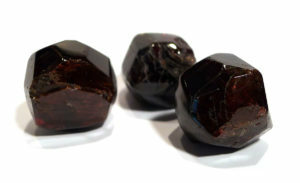 The old name for the deep red almandine or pyrope garnet is carbuncle (named Carchedonius Garamanticus = Carthaginian or Garamantic Carbuncle in 77-79 AD by Pliny the Elder); this is now considered old-fashioned, although still in use. 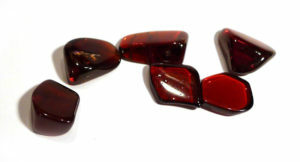 Garnet has been associated with the sun and the element fire for thousands of years. Early Greek writing, believed to have been influenced by Ancient Egyptian texts, alludes to carbuncle’s ability to glow in the dark. The same suggestion followed later in the writings of Pliny the Elder and others, through to the Middle Ages, and there are many references in different cultures to the use of carbuncles and rubies for lighting dark rooms with enough light to read by. Carbuncle is virtually black before polishing, after which its inner fire shines through, and so was often compared with a glowing coal. 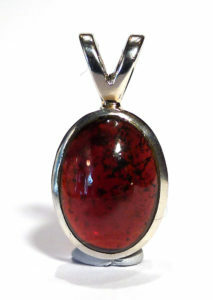 In this way, garnet represents the Soul’s Journey; just as polishing a garnet will bring out its hidden fire, life’s trials and difficulties are seen as a polishing process for our hidden character. Traditionally, garnets were worn to bring luck, wealth and blessings, and according to Michael Gienger, were often set into shields and the hilts of swords to protect warriors against harm and symbolise the Soul’s Journey. 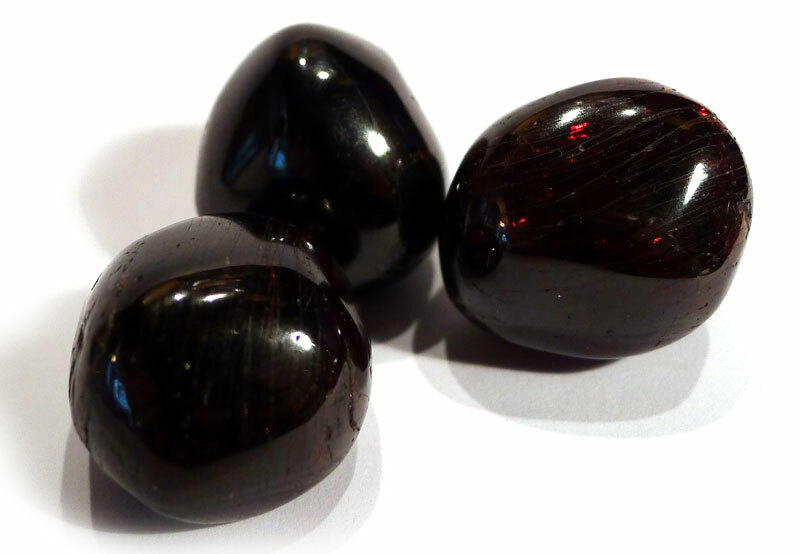 In traditional healing, garnet was believed to be extremely powerful, and only to be used for short periods of time, primarily to heal diseases of the heart and to staunch blood flow, as its deep red colour was linked to blood. In the 19th century, some Asiatic tribes used carbuncle in place of bullets, as they believed the wounds inflicted would actually lose more blood, making them more deadly than those caused by conventional bullets. Hildegard von Bingen (12th century) recommended laying carbuncle on the umbilicus (Sacral Chakra) as a cure for general illness and infection, and suggested placing it on top of the head to treat headaches, in both cases removing it as soon as it felt warm to the touch or the patient warmed up. Almandine garnet is named after Alabanda in Turkey, an ancient gem-cutting centre.